Photo courtesy of Ralph Cooley. Menu found in Beijing Restaurant. The more you eat, the more you toon. Because we ran out of fried crap! Chinese toons? Would it be Exploded Daffy Duck? Who quick fried Roger Rabbit? An hour later it looks like Speed Racer’s been spinning donuts in the seat of my undies. Chinese beans create Chinese toons… later! There’s nothing like beans to make you animated! I ate some and my eyes bugged out. I’d rather go to a Tex-Mex restaurant… for Tex Avery toons. That really fries my turnip. And his fart rumbled on for an hour. TV guides nowadays makes TV shows really look delicious…or is this a menu? This is actually a perfectly accurate translation. 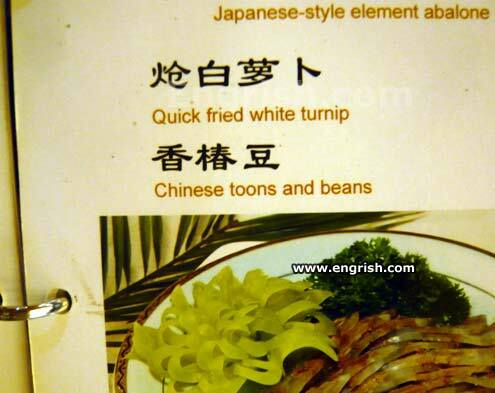 A Chinese toon is a type of vegetable, though admittedly its English name sounds silly. @AAA: Toona of the C.
Waiter: Toons and toons of them. I know the chinese are also very good at frying loonies. MOM! Phineas and Ferb are in my mooncakes with beans! Remember me Eddie? When I cooked your brother I talked JUST LIKE THIS!